My 10 year old son is OBSESSED with tacos! So, of course, we had a taco themed birthday party! Here are the invitations I made. If you would like to purchase the clip art I used to make these, you can find it HERE. 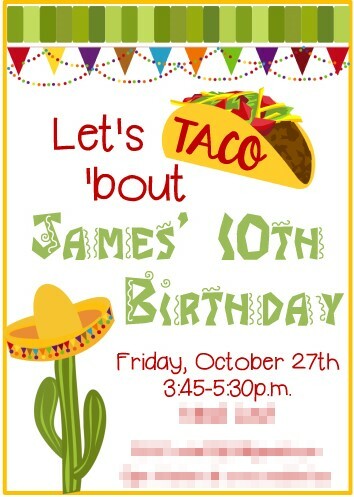 The fun font in green is "JI Chimichanga". For food, we had a taco bar obviously! I was surprised how much the kids liked this but I guess they are used to pizza only at parties! They LOVED the taco bar and the queso! For dessert, we had taco cupcakes! To make the taco, I cut sugar cookies in half and "glued" them together with chocolate frosting. I sprinkled crumbled brownies over the chocolate frosting. I piped green "lettuce" frosting over the brownies with a star tip and added lines of white "sour cream" frosting with a small round tip. For the yellow "cheese", I melted white chocolate and colored it yellow with candy color (you can NOT use normal food coloring). I piped it in long thin lines on wax paper and froze it. Once it was frozen, I cut it into the shredded cheese shapes and added it to the tacos. The red "tomatoes" are mini M&M's. These were SO cute and yummy too! For the favors, we did paper tacos with lollipops and fidget spinners with taco stickers on them. I got the fidget spinners & taco stickers on Amazon. I made the paper tacos by cutting yellow card stock using THIS pattern on my Silhouette. I folded the tacos up and taped them on the sides. I added brown shredded paper in the bottom and brown, green, red, and yellow lollipops around the top. I used double sided tape to secure the lollipops if needed. The gift tags said "Muchas Gracias" and can be downloaded HERE. I hope you have as much fun at your taco party as we did at ours!